'Always On' - The call to action of our time. i) Evolution of technology and platforms. ii) Changes in consumer behaviour. iii) Legacy business models. i) Technology and platforms are growing at a frightening rate. Facebook, Instagram and Google continue to dominate / democratise the advertising industry. Whilst print & TV are far from completely obsolete, digital spend has now usurped them and continues to grow. Ii) Consumers habits are continually evolving. Instagram is now becoming a social channel of choice for a growing number of western millennials with mobile the device of choice. Consumer awareness of data privacy is beginning to filter throughout the industry as data becomes limited. iii) Every advertising business has a legacy of doing things a certain way. A businesses age will generally determine its ability to innovate and make strategic, tactical changes in the way it operates. When coupled with rapidly evolving technology and consumer habits, you have a compounded issue most service-based businesses face in 2019. Advertising is now truly morphing into a fully integrated quasi-approach, through-the-line model. Speed, agility and integration are the order of the day. To keep ahead of the curve, brands are adopting a more publisher/broadcast mentality incorporating ‘always on’ multi-channel creation and distribution with cross-platform analysis. What does this mean to brands and agencies? Meanwhile a new crop of tech savvy, agile companies are steaming full speed into the playground where creative shops and holding companies traditionally ruled the roost. What Does ‘Always On’ Mean? 'Always On’ is a whole new marketing mindset developed for the digital-era that the most sophisticated brands are adopting. These brands know it’s a quantity game incorporating quality and authenticity whilst being resource efficient. ‘Always On’ is a commitment for brands to engage with their audience on whichever channel their target audience is on. It’s a commitment to keep telling stories and to add to social conversation, not to pollute and withdraw from it. Social and digital has a phenomenal ability to filter and eject waste from the system. For example, where advertising is brand heavy, irrelevant and un-targeted - algorithms will de-prioritise it in the feeds and begin to increase CPA’s, especially where paid posts are involved. Smart brands stop, assess the data and realise their mistake. Most brands begin to pay over the odds to distribute poor creative. Some de-prioritise targeting and show poor creative to non-relevant audiences, artificially bringing CPA’s down - creating losers all-round. Continuous rapport and dialogue with target customer: ongoing conversations are created; NOT a blitz of intrusive quarterly campaign messaging that goes as quickly as it appears. Pricing efficiencies: delivering sustained content programmes over an extended period of time allows economies of scale in both planning, production and media distribution. It's a commitment to always be communicating, which requires continual spinning of creative, production and distribution departments. By comparison, quarterly campaigns can be cumbersome with multiple stakeholders and more sales oriented vs conversational messaging. Increased engagement: the world's best content marketing brands understand it’s about quantity and quality. Uplift and awareness increase: continual messaging begins to increase brand awareness and uplift. Not through interruptive brand logo / product reinforcement, but through adding value to social conversations. The valuable ‘next step’: data has shown us first-hand that if you take people on a journey, inform and educate them - they will bother to take the next step and find out more. If you've watched a compelling Netflix documentary or watched something good online - chances are you've gone to Wikipedia, IMDB or a related website to find out more information… we’re now seeing it every single day across our branded campaigns. They are becoming resistant to intrusive ads: in a world of content and giving back, they want to hear messaging that implies trust and authenticity. They want to inform and learn: audiences we survey want to hear stories of people doing great things and brands empowering them to do just that. Messaging designed for the channel they are using: shoehorning content originally designed for TV onto Instagram isn't going to end well for anyone. ‘Always On’ removes this issue. How does long form compare to short form? Everyone thinks long form is dead. It isn’t. The rise of Netflix, YouTube, IGTV, Hulu and many, many others indicate consumers are craving high quality content. Our largest clients are actually seeing higher engagement and uplift for long-form content across social channels than traditional short-form gimmicky content. Things are changing but the story & narrative needs to be compelling and interesting. In the past 12 months we’ve seen brand uplift consistently reaching 23%+ and sentiment over 95%+. What does 'Always On' look like to CLICKON? We view ‘Always On’ as a commoditised package that is delivered every month. Our partners know they will get a hero ‘anchor’ creative alongside 50-100 supporting assets to propel the campaign across every device and channel. Poorly performing creative is tested, re-edited and re-deployed until it reaches engagement benchmarks - within hours, not days. Our team's plan how the creative can live across every channel and generally plan across three, six and twelve month campaign timelines. 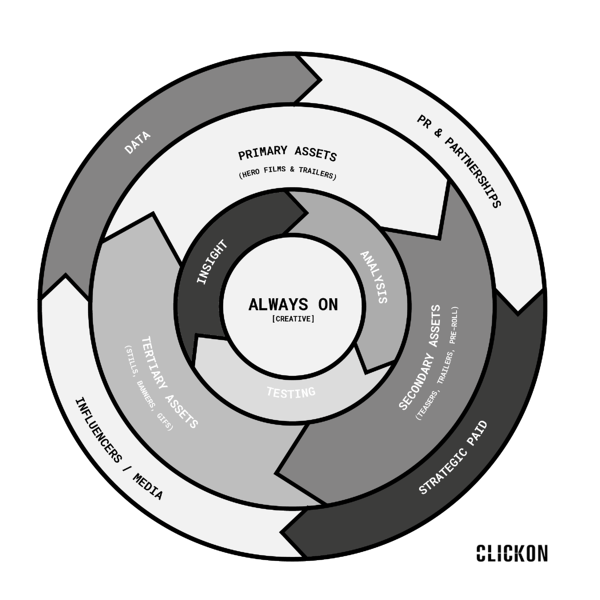 'Always On' is a flywheel of self perpetuating sustained activity. We know where content will be living before we even go into production. How We Use ‘Always On’ To Redefine Branded Advertising. CLICKON has been innovating with 'Always On' for over two years. Our evolution in branded content, publishing and media, has crafted a business that knows how to create, test and deliver content at scale. We're so committed to its future, we built a revolutionary new software product called iQ that lets brands and clients 'take back control' of the process with full transparency. It provides end-to-end process to create, feedback and deploy global campaigns at speed. ‘Always On’ also allows our partners to become their own unique storytellers, data owners and media owners. We see our role as facilitators in helping brands become their own ‘Netflix’, providing the technology and resource wherever it’s required. From empowering in-house teams with technology, to finding stories and producing creative - we do everything we need to help our partners succeed month in, month out. There is no greater call to action than to work alongside an organisation like Special Olympics. In every corner of the earth, Special Olympics is changing the lives of people with intellectual disabilities. Our work centers around a simple premise. Telling and spreading the inspirational stories of the people the organisation works to help. 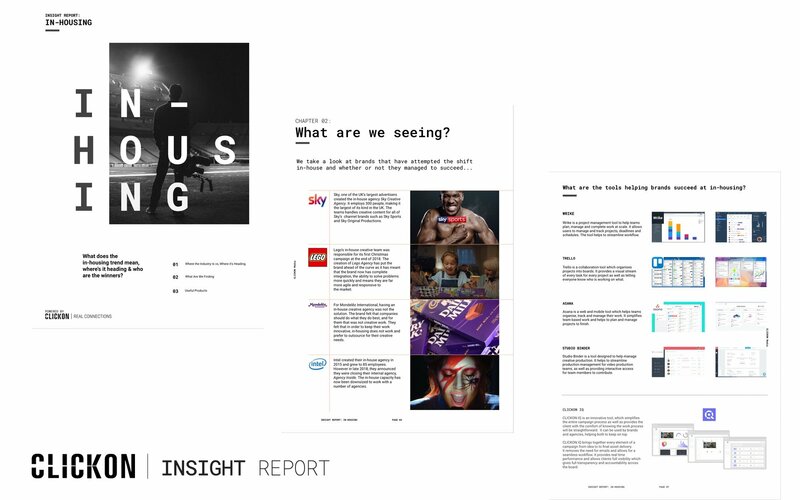 Our work: We work alongside the incredible SO team to help them plan, ideate, produce and distribute 'Always On', story-based content every month across the year. Each monthly campaign includes a hero documentary film asset supported by over 28 supporting assets customised for each channel. Link to Case Study. CLICKON Studios teamed up with VMLY&R Memphis to produce Faces Of The Fleet. When most people think of the Navy, they see ships, jets and advanced technology. They rarely see people, the ones who know the real meaning of Navy life. How do we shift focus from technology to real and raw stories of our men and women in uniform – inside their real environments? How do we inspire a new generation of men and women to consider a career in the United States Navy? Our work: Working alongside the Partnerships team, we work to deliver 'Always On' campaigns each month. Each campaign is anchored by a hero docu-film with an incredibly human story, followed by supporting assets for every distribution channel, from YouTube Pre-Roll to IG stories. Link to Case Study. How could General Tire UK access an audience segment increasingly hard to reach across traditional media channels? How could they inspire, influence and raise awareness of the importance of tire choice to consumers across the UK? How could they make the message stick and create excitement around a traditionally ‘unsexy’ product? Our work: The campaign encompassed ‘Always On’ assets numbering over 50+ for every digital channel, alongside targeted and re-targeted distribution spanning both GT social channels and third party partners. Link to Case Study. Our work: The series focused on storytelling and narrative, conveying inspirational backgrounds of four athletes who regularly run across London. The series was delivered as an 'Always On' campaign across four episodes, including supporting assets such as teasers, trailers, hero films, 360 video, banners and stills. Link to Case Study. What tools do we use / have we used to deploy ‘Always On’? We've learnt that ‘Always On’ is as much about process management as it is about churning out hundreds of assets. Creative, production, data/testing, approvals, storage and deployment all need to be seamlessly taken care of. 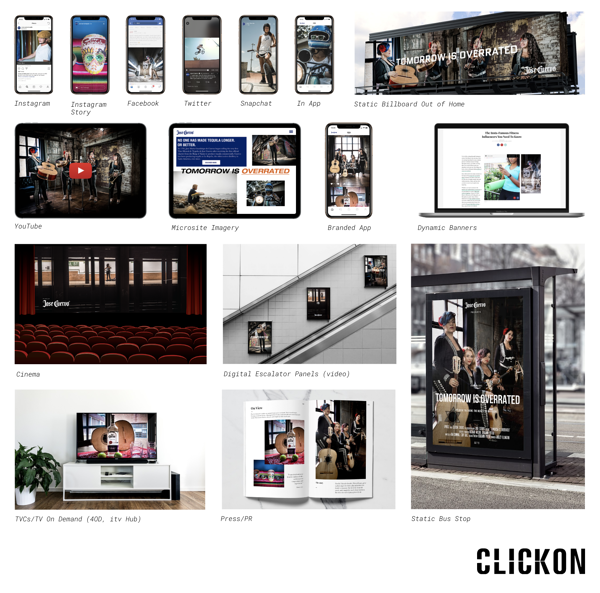 CLICKON IQ: We realised some years ago that there was no product that fully catered for what brands need in order to win in 2019. Every tool had compromises and didn't integrate the entire workflow, leading to the usual fragmentation between brand and agency teams. iQ was built to allow client's to 'take back control', solving end-to-end workflow and providing transparency at all stages. It does the heavy lifting including creative, pre-production, feedback and approvals, asset management and sharing, to testing, reporting and campaign analytics. ← Does Facebook Need A Dislike Option?